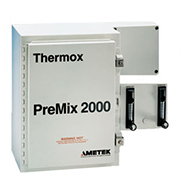 The PreMix 2000 analyzer accurately and continuously measures the proportions of oxygen and fuel in pre-mix gases, operating in either excess fuel or excess air conditions. The analyzer is fed a small sample of the air/fuel mixture burning it and them measuring the next oxygen or next excess fuel content of the mixture. Measures air/fuel ration in open-flame applications where flue gas measurements are not practical. Measurement and display options include excess oxygen, excess fuel, combined excess oxygen to excess fuel. fuels/oxides, oxides/fuels and combustibles. Calculates calibration gas mixture concentration for excess fuel ranges. The 2000 Series microprocessor control unit provides a 4 line digital display, analog outputs, alarms, system and sensor diagnostics, software supported calibration. Accuracy ± 2% of measured value or ±0.1% O2, whichever is greater; ± 5% of measured value or .25% excess fuel, whichever is greater*. Power 115 VAC ± 10%, 50/60 Hz., 1200 VA max. ; 230 VAC ± 10%, 50/60 Hz., 2400 VA max.